Description - The Brand name of this medicine is Resihance . Resihance medicine contains generic Regorafenib . 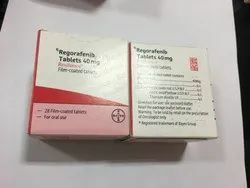 Regorafenib are available in form of Tablet. Each coated Tablet contains 40Mg Regorafenib. One Pack of Resihance 28 Tablets. Manufacturer company name of Resihance is Bayer Schering Pharma and Marketed company name of Resihance is Zydus, India. USED - Resihance is a cancer medicine that interferes with the growth and spread of cancer cells in the body. Warning: Resihance medicine out of the reach and sight of children and away from pets, never share your medicines with others, and use this medication only for the indication prescribed. The information contained herein is not intended to cover all possible uses, directions, precautions, warnings, drug interactions, allergic reactions, or adverse effects. Description - The Brand name of this medicine is Nublexa . Nublexa medicine contains generic Regorafenib . 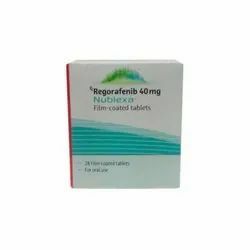 Regorafenib are available in form of Tablet. Each coated Tablet contains 40Mg Regorafenib. One Pack of Nublexa 28 Tablets. Manufacturer & Marketed company name of Nublexa is Bayer Schering Pharma, India. USED - Nublexa is a cancer medicine that interferes with the growth and spread of cancer cells in the body. Warning: Nublexa medicine out of the reach and sight of children and away from pets, never share your medicines with others, and use this medication only for the indication prescribed. The information contained herein is not intended to cover all possible uses, directions, precautions, warnings, drug interactions, allergic reactions, or adverse effects. Description - The Brand name of this medicine is Stivarga . Stivarga medicine contains generic Regorafenib . Regorafenib are available in form of Tablet. Each coated Tablet contains 40Mg Regorafenib. One Pack of Stivarga 84 Tablets. Manufacturer & Marketed company name of Stivarga is Bayer, India. USED - Stivarga is a cancer medicine that interferes with the growth and spread of cancer cells in the body. Warning: Stivarga medicine out of the reach and sight of children and away from pets, never share your medicines with others, and use this medication only for the indication prescribed. The information contained herein is not intended to cover all possible uses, directions, precautions, warnings, drug interactions, allergic reactions, or adverse effects.